Air Earbuds by crazybaby Reviews: Superb Audio Quality? Air by crazybaby wireless earbuds feature unique carbon nanotube speaker membranes that promise to deliver superb audio while remaining reasonably priced. What is Air by crazybaby? Like many other wireless Wi-Fi headphones, Air by crazybaby promises to deliver a secure fit in a smaller, portable package that’s water resistant, is rechargeable on the go, and works with any Bluetooth-enabled device. Unlike much of the competition, however, crazybaby tells us that Air also provides single-button control, a more stable connection, and an EQ customizer via their iOS and Android apps. If you’ve been paying attention, you probably noticed many high-profile wireless earbuds entering the market lately. But how can you choose the right option for your needs? Should Air by crazybaby make it on your shortlist? You’ve got questions; here, we’ll help provide some insight by discussing what we learned during our research. How Does Air by crazybaby Work? What’s Up With Their Carbon Nanotubes? Each Air earbud is 1.01” (25.6mm) long, 0.47” (12mm) wide, 0.67” (17mm) high, and weighs 4.5g. The charging capsule is 5.22” (132.5mm) long and 1.18” (30mm) thick. A single charge on your Air earbuds will provide up to 3 hours of listening time or 4 hours of talk time. Using the capsule, however, will increase your listening time to 15+ hours and talk time up to 20 hours. When the time comes, we’re told it will take your earbuds two hours to fully recharge. While Air earbuds can’t be used directly in water, they’re IPX5 water resistant, which should provide more than enough protection from sweat and the natural accumulation of dust and grime. Air earbuds feature Bluetooth 4.2 connectivity that helps provide a consistently reliable connection to any compatible device from up to 10 meters away. According to crazybaby, they analyzed hundreds of ears during development to ensure Air fit a wide variety of profiles. You’ll also find three, medical-grade Sport Sleeves that are ultra-light, skin-friendly, and help customize Air’s fitment, without adding pressure to your conch or ear canal. This, combined with Air’s single-button control, allows you to answer/hang up calls, play/stop music, skip to the previous or next track, and even use voice assistants like Siri or Amazon Dot’s Alexa. As mentioned earlier, it seems that crazybaby’s biggest emphasis for the Air is on audio quality. To accomplish this, we’re told the company’s “electroacoustic legend,” Dr. Yu, partnered with Tsinghua University and Foxconn Associate Labs to develop a proprietary carbon nanotube diaphragm that allows the speaker driver to remain compact and durable. Additionally, each of these carbon nanotube diaphragms is made individually, versus mass-produced, to ensure strict quality standards. Finally, we’re told that Air’s iOS and Android apps allow you to customize your EQ even further. How much will you pay for all this technology and wireless convenience? How Much Do crazybaby Air Wireless Headphones Cost? 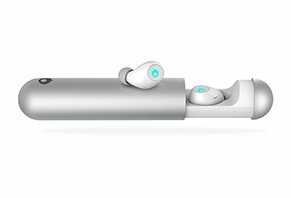 Crazybaby’s Air earbuds are currently only available for preorder via their Indiegogo campaign (more about this next), with an estimated delivery date of January 2017. Perks range between $109 and $198. The company just released three new colors at the time of our research (Lava Orange, Volt Green, and Space Gray), along with the standard White/Blue or Black/Red. To request a refund or process a warranty claim, you’ll need to send an email to service@crazybaby.com. Are There Any Early Reviews for crazybaby Air? At the time of our research, crazybaby had nine days remaining in their Indiegogo campaign for Air, although they had already raised nearly $1.7 million based on an original goal of just $50K. Because they won’t make their way to consumers until January 2017, though, we didn’t encounter any in-depth, hands-on reviews. However, Forbes’ Ben Sin had a chance to try on a pair of prototype Airs when visiting crazybaby’s Shenzhen, China office, originally to review their Mars speaker (more about this in a moment). While he didn’t spend a lot of time with the Airs, he noted that they felt comfortable in the ear, delivered good sound quality, felt sturdy and well-made, and provided instantaneous pairing thanks to the CSR chip. From a company perspective, crazybaby was founded in 2014 by Allen Zhang, who’s only in his early 30s. The company is based out of Salt Lake City, UT, although, despite his young age, Allen has been working in Shenzhen for more than 12 years, originally for Chinese electronics company TCL. Since its founding, crazybaby has successfully brought one product to market, with another close on its heels. Let’s talk more about this next. Are There Other Products From Crazybaby? The first product released under the crazybaby brand was Mars, a unique levitating speaker that promises to deliver “nearly loss-free sound,” along with a sleek design. On Amazon, the Mars speaker had 130+ customer reviews and an average rating of 3.3 stars. Most compliments seemed to reference high-quality audio and craftsmanship, as well as attractive design. On the other hand, common complaints related to high price, limited functionality (no AirPlay or WiFi connectivity, no streaming ability, can’t connect via aux in, etc. ), so-so audio quality (especially regarding bass), inadequate volume, and questionable value compared to other Bluetooth speakers. Crazybaby’s second product, Luna, is a wireless speaker that uses proprietary technology to improve transmission distance and sound quality. Additionally, its dedicated computing system and MESHNET technology enable up to 32 Lunas to connect with one another, along with multiple users allowed. Luna’s crowdfunding campaign recently ended and was in a trial production run. Now, let’s return to crazybaby’s Air earbuds and find out how they stack up against the competition. The HighYa team has reviewed many popular wireless earbud options, including Kanoa, Rowkin Mini, Samsung Gear IconX, and Protek Wireless. Other popular models include the Earin, Apple AirPods, and Bragi. When it comes down to it, which of these options might serve you best? Is Air by crazybaby a contender? Let’s bring it all together. Who’s the Ideal Customer for Air by crazybaby? Like any other product, no single wireless earbud option will satisfy every consumer’s needs or match their personal preferences. In other words, a lot of unique factors come into play when choosing the “best” option. Is price your number one factor? If so, Rowkin Mini is the clear winner, followed by crazybaby’s Air. Run and recharge time? Rowkin, Bragi, and Protek (which also features a CSR chipset) win out in this regard. Fitness tracking? Your options are limited to Kanoa and IconX. Only interested in products that are currently available? You’ll have to rule out Air and Kanoa. Regarding this last point, when discussing yet-to-be-released electronics, we often talk about the potential risks involved with backing a crowdfunding campaign. In this instance, though, crazybaby has already released one successful product, with another (Luna) on its way shortly. While this certainly doesn’t remove the element of risk, we think this speaks volumes about what you might reasonably expect with their Air earbuds. Just keep in mind that your ability to obtain a refund could be limited—and completely goes away once Air has shipped—so be sure to carefully consider your purchase before placing an order. Did your Air by crazybaby earbuds arrive on time? Did they deliver superb audio quality? What about the company’s other claims? Tell the world by writing your review below! Silly me trusted their story and ordered two sets on their Kickstarter campaign (one for my son). In looking at their website right now, they still make pretty much the same claims, when they have to know of all the problems people have had. The sound quality when they work is outstanding, but the right side one constantly kicks out. Also, the battery life is very poor at only 1.5 hrs at best. So frustrating that we wasted our money. Do not buy these earbuds. (Air nanos). The sound quality yes is great and has good bass. But their Bluetooth is terrible and cuts in and out every 5 minutes. Also, they happen to have a refund policy of 30 days, which is convenient for them because both of my headphones (the original ones I bought and the replacement ones they sent after one earbud conveniently stopped working after a month in a half) stopped working after 30 days. I am now on my third replacement of these earbuds in which I was supposed to receive about a week ago have still not arrived. Overall they have good sound quality but the Bluetooth connection is horrible, and the earbud's life is way too short for my liking. I've bought $20 Skullcandy headphones from Target that have lasted me four times as long as these do with somewhat good sound quality. Do yourself a favor and stay away from these earbuds. They have a lot of re-design to do before I ever think about buying them again. They are he greatest things I've ever tested. Definitely 50,000/10 beautiful high-quality nanotube technology. Great IPX66 waterproof technology. Much better than the crappy dental floss looking AirPods. Also, they're super high quality and with multi-uses, I use them before bed at night. Beautiful technology. Best feature is that it vibrates when it charges. I bought these earbuds from the Indiegogo site, thought it would be a nice device to have. They worked well for the first couple of months and then it went out of sync, meaning audio/video had a delay for like a good second or two. At first, I thought it was my internet connection or maybe a Bluetooth incompatibility, but I tested on different brand new devices and they all had the same results. So I emailed their service department and they forward me to their NA division, back and forth email from this rep named Shaun. He sent me some instructions for the RMA, which I did right away and then that's it...no emails, no RMA, nothing. Its been three months now and I am emailing them over and over again thinking if somebody can send me a response. Moral of the story: Please do not waste your money on this crappy product. Worst experience I have ever had. I was only able to use the earbuds once before the left earbud stopped charging. I tried over and over to align it in the capsule to no avail. It simply would not charge. I contacted Customer Support six times in four weeks and did not hear anything back until a few days ago. At that point, I wanted to return the earbuds and get a refund. They gave me some tips to help it charge (thanks, that would have been nice to know weeks ago) and are making me pay for the return shipping since they aren't defective. Honestly, I would never recommend the company to anyone. They made excuses that they get so many inquiries daily and that was the holdup. I'm sorry, but if you say you will get back to a customer within 72 hours, you probably should. I am so disappointed with this company. Also, I ordered their matte gold, which is 100% rose gold. So that is also disappointing. I bought these from a Brookstone at the airport while traveling so couldn’t return to the store. The right earbud drops CONSTANTLY. Every 10-15 seconds it drops and then after about 10-15 minutes it completely stops working and I have to put it back into the charger, turn off the Bluetooth, and start the process all over again. There is NO phone number for customer support at crazybaby anywhere. Not in the packaging, not on the website, nowhere. They work hard to stay away from you. Crazybaby tells you to email them for support, but they never follow up. I’ve emailed them eight, yes that’s EIGHT, times and received nothing but an auto-generated email each time. After two weeks I have filed a dispute on the charge with AMEX. SAVE YOURSELF and don’t by any crazybaby product. Total trash product and horrible customer support! I signed up for my Air by crazybaby earphones fairly late in the Indiegogo campaign - November 2016. The design and specs looked good, the price seemed fair, and the estimated delivery date of January 2017 wasn't far off. When the earphones eventually arrived in August 2017, I was on a long overseas holiday, and I didn't get to test them until October. My experience is pretty much exactly the same as all of the other reviews posted here. While the sound quality delivered by Air is OK, that's really only useful when the earbuds are actually delivering sound. Which, most of the time, they're not. Bluetooth connectivity on the Air earbuds is woeful. Even with my phone in my coat pocket (less than 30cm from my ears), dropouts are constant. I bought the Air earbuds to replace my Plantronics BackBeat GO 2 earphones, which I hate. As things have turned out, I'm using the Plantronics earphones every day once again, because they are streets ahead of the Air. The design of the Air is great - but I didn't buy the earbuds for ornamental purposes. I can't recommend them in any circumstances. They're going in the bin. In summary, nine months late in delivering. Connection hard to make. Keeps dropping the signal intermittently. Then one of earbuds stopped working. Customer support is non-existent. They send me a replacement bud eventually, but this doesn’t work either. Sick of chasing them up for service and will buy some iPods instead. I would NOT recommend them uber any circumstances. When I purchased in November, their messaging made me believe they would ship at the end of November. Then, their updates made it seem it would be the end of December. They did respond to two different emails asking for an update, but they were vague responses on when they would ship. To make matters worse, I get an automated campaign update email from them every two weeks telling me how great the product is, and how they continue to ramp up manufacturing and shipping. The same thing is happening to me. I ordered the so-called “early bird,” and apparently, my birds have been lost. I received one of my two sets and my emails haven’t been answered either. I have to agree with the other reviews, the sound quality is spotty and the connection continuously drops. I was extremely excited about this item, I’ve returned to using my wireless Dr. Dre headphones. Keeps cutting out and their customer service is nonexistent! I got the first set, and the right side keeps cutting out! After 18 email and 10 months, I finally get a replacement. The new set does the same thing! Now their customer service won’t answer emails. I tried with iPhone 7 and Samsung phones and the same thing happens. When I first got a response, they said it was the object between the earbuds that causes the problems! So they are saying my head is too thick! Really! All I can say is, don’t buy from crazybaby as their product is faulty and there is no customer service. Firstly, let me say that the air Nano works a treat, but the silicone sleeves leave a lot to be desired; it tears easily. I contacted Support to let them know and was basically fobbed off with them saying there are three sets in one pack (I only received one set, which is why I contacted them in the first place). I contacted them again to be told check the box. I responded with "I have, that's why I'm contacting Support AGAIN," then to be treated substandard and asked to supply a bloody photo. Have crazybaby standards for quality gone? Write a Review for Air by crazybaby!